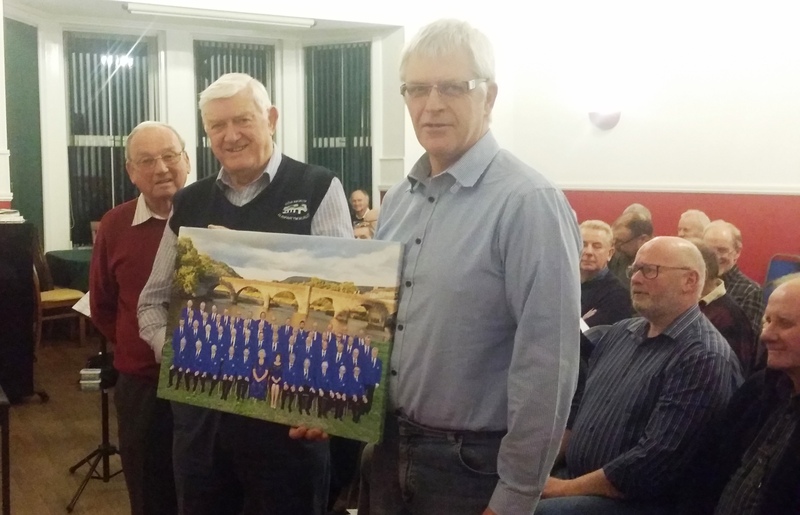 Bob Jones, longstanding Treasurer of Builth Male Voice Choir, was presented with a canvas photograph commemorating the 50th anniversary of the Choir in recognition of his many years service to the Choir. 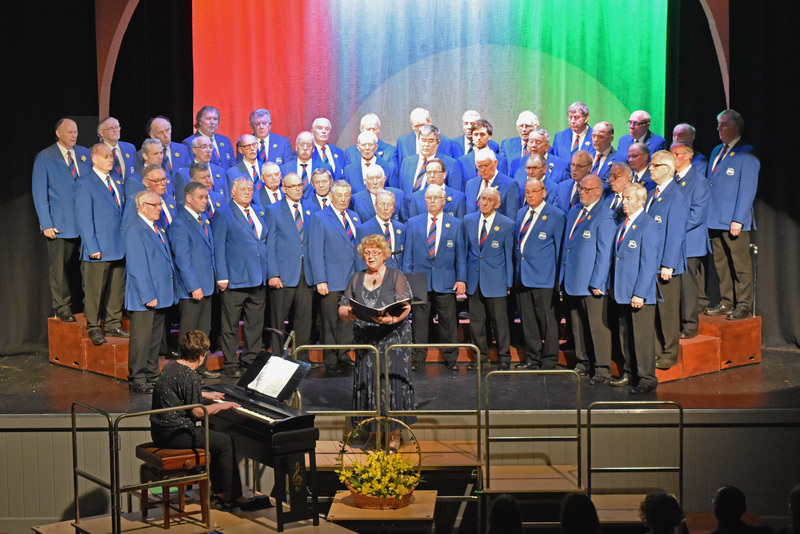 On 2nd March, for the second year running, Builth Male Voice Choir held its annual St David’s Day concert at the Strand Hall in Builth. This year however was the last concert to be led by their Musical Director Luned Jones. The concert was therefore a special one both for the choir and for Luned. Originally from Llanelli, Luned took on the role of Musical Director in 1985 having been accompanist previously and thereby giving 48 years unstinting service to the choir. Chairman Derek Hope presented Luned with a Welsh Royal Crystal decanter as a token of appreciation for all the music leadership she has given to the choristers. Megan Jones on behalf of the Male Voice Choir Supporters also presented Luned with a bouquet. Luned’s husband Bob has also now retired from the role of Treasurer which he has held for 35 years. He later received a painting of the choir in gratitude. The choir’s Assistant MD Adrian Morgan has now taken over the challenging role of Musical Director. The concert provided a very varied programme. The men’s choir was supported by Builth Ladies Choir who gave a sparkling performance with songs such as Calon Lan and Hail Holy Queen. Ysgol Calon Cymru provided a melodious vocal ensemble singing Lawr ar Lan Y Mor plus a cello and vocal solo. In addition South Powys Youth Music played with great virtuosity led by their Musical Director Tim Cronin in songs such as Shenandoah and Fiddlers Day which certainly went with a swing. One of the young musicians was in fact Luned and Bob’s granddaughter. All the proceeds from the concert were being donated to SPYM. The musical highlight of the evening was the young tenor soloist Robert Lewis, originally from Llanfyllin but now based in London. He delighted the audience with his powerful renditions of songs such as Bugail Aberdyfi and Puccini’s Che Gelida Manina from La Boheme. Luned then conducted her final performance with the choir which included singing the solo in Ai Am Fod Haul yn Machlud (Is it Because The Sun is Setting).The concert concluded with a joint performance of O Gymry by Robert and the men’s choir followed by a rousing performance of Hafan Gobaith with the combined Builth choirs. 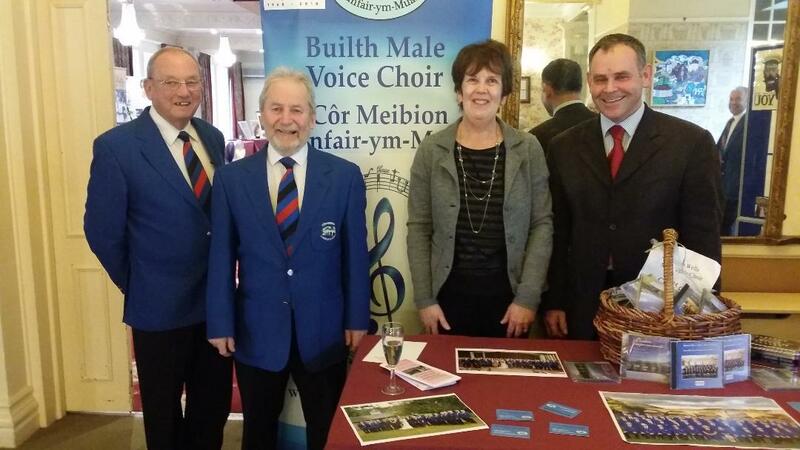 Choir members promoted Builth Male Voice Choir at the Spring Wedding Fayre at the Metropole Hotel, Llandrindod Wells on Sunday 17 February. The Choir performed a set of romantic songs to entertain the visitors conducted by Adrian Morgan with accompaniment by Ann Bufton. A number of prospective brides and grooms made enquiries at the stand taking away Information leaflets and expressing an interest to invite the Choir to be part of their wedding plans. Exactly a year later and we are at the Metropole Hotel again for our last engagement of 2018 – our fiftieth anniversary year. The Metropole has welcomed us eight times this year and approximately 120 enthusiastic guests gave us a standing ovation at the end. Maybe it was the Welsh National Anthem that got them on their feet? David Power again relaxed the audience with his inimitable compering. Luned Jones and Adrian Morgan conducted with Ann Bufton accompanying two sets including some favourites that were much appreciated. 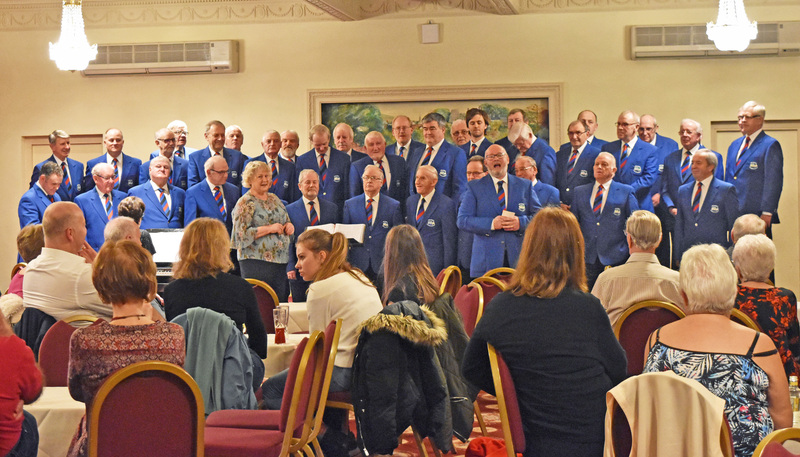 The Choir held its AGM at the Greyhound Hotel on Wednesday 19 December. For details of the officers and committee members see Choir People page . 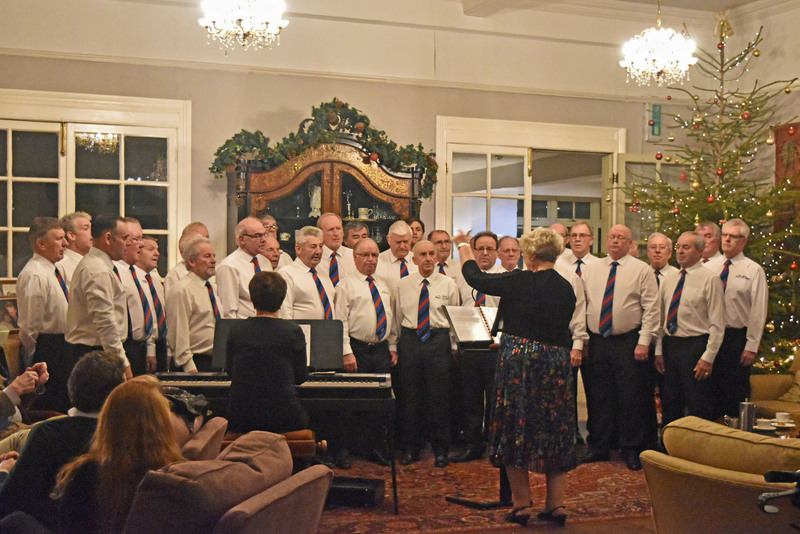 Following the AGM the Choir sang a selection of songs in the dining room to a group of friends who were visiting Mid Wales for country sporting events organised by William Baxter from Buckinghamshire. The visitors thoroughly enjoyed the Choir’s performance and called for an encore. The Choir concluded with “We wish you a Merry Christmas” before retiring to the bar for drinks and impromptu singing. 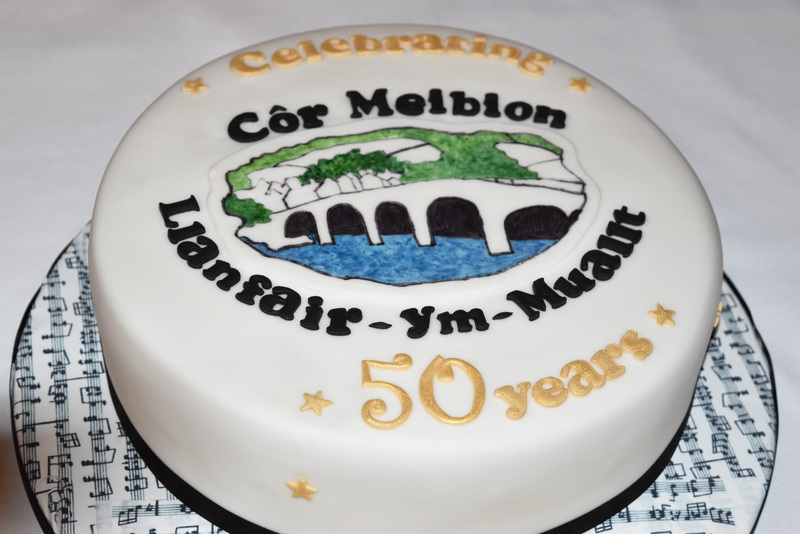 The Choir’s 50th Anniversary Celebration Dinner was held at the Metropole Hotel, Llandrindod Wells on Saturday 1 December. 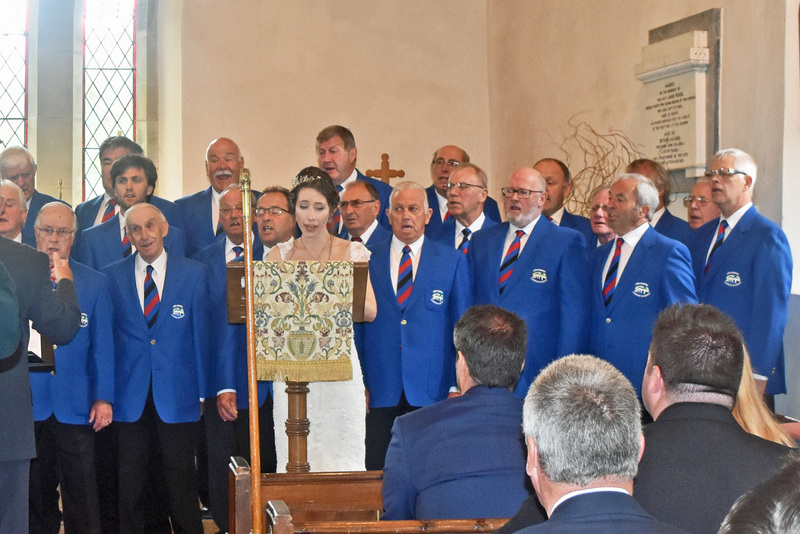 Dame Shân Legge-Bourke, recently retired Lord-Lieutenant of Powys, was the guest of honour at the celebrations attended by nearly 100 guests comprising choir members, vice-presidents and friends of the choir. Derek Hope, Chairman of the Choir, welcomed guests to the dinner to celebrate fifty years of singing together and supporting local charities. 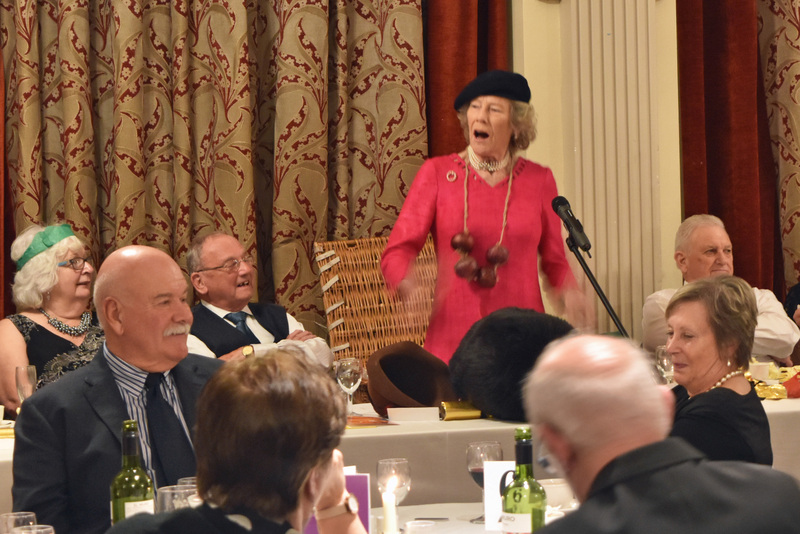 Guests enjoyed a varied menu in a three course dinner which was followed by David Power, master of ceremonies, introducing the choir’s musical director, Luned Jones, who gave a detailed and captivating speech. Luned traced the history of the Choir from its beginning in the Autumn of 1968 to the current day. 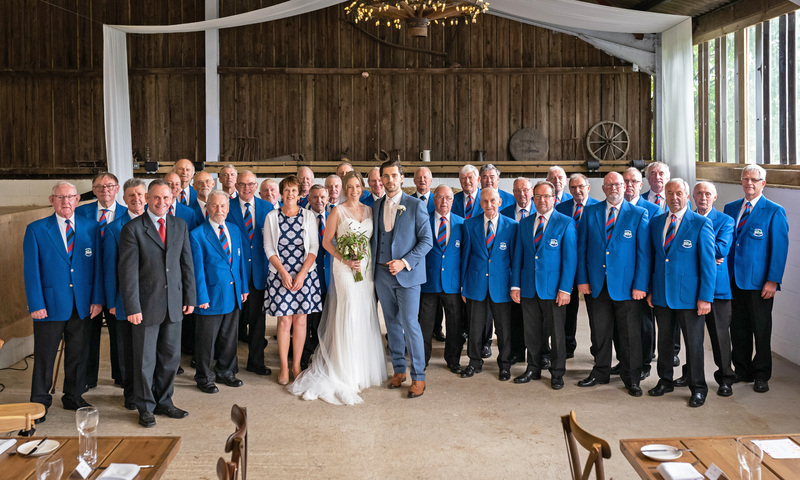 She noted the choir was formed when a group of enthusiasts led by Jack Francis met at the Builth Wells Cricket and Rugby Club. She welcomed Ceinwen Bufton, from Hundred House, who was the Choir’s first accompanist until she left the area on getting married in 1973. Luned took over as the Choir’s accompanist at that date and then became Musical Director in 1984 following the retirement of Jack Francis and has now completed forty five years of devoted service to the Choir. In 1984 Ann Bufton became the new accompanist a role which Ann continues to serve today. Dame Shân Legge-Bourke then spoke of the national and international trips made by the choir in an entertaining presentation. Adorned in the national headgear from each of the countries toured – France, Germany, Czech Republic, Holland, Belgium and Ireland – she led the guests in songs and music representing each nation. As a mark of appreciation and to commemorate her contribution to the celebrations Derek Hope (Chairman) presented Dame Shân Legge-Bourke with a shield depicting the Choir’s badge. Luned Jones and Ann Bufton were given the honour to cut the celebration cake for distribution to the guests. 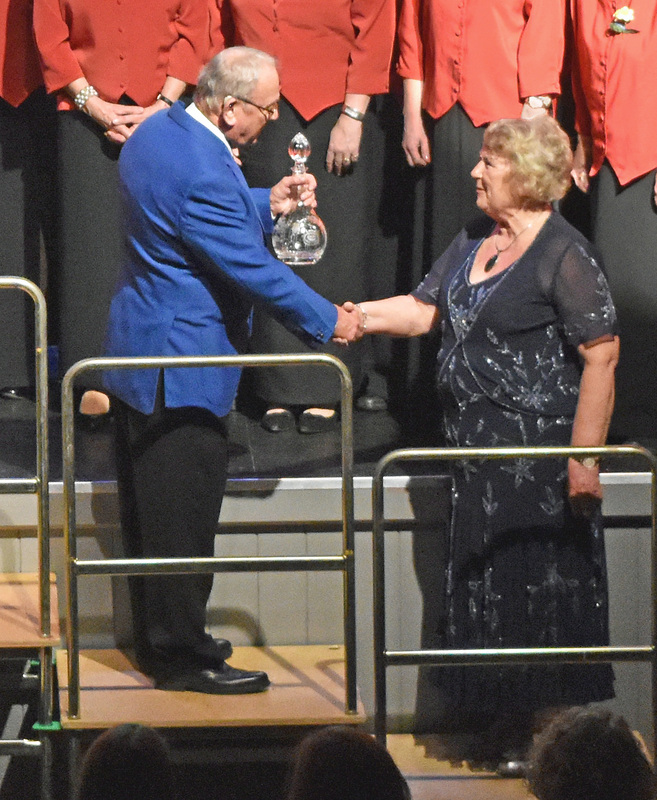 Derek Hope confirmed that Luned Jones will be retiring in March 2019 and thanked her for forty five years of unstinting loyal service to the Choir which was met with a rousing ovation from the guests. He announced that the current Deputy Director of Music Adrian Morgan will be taking over the role of Musical Director in March and looked forward to many more successful years for the Choir under his leadership. 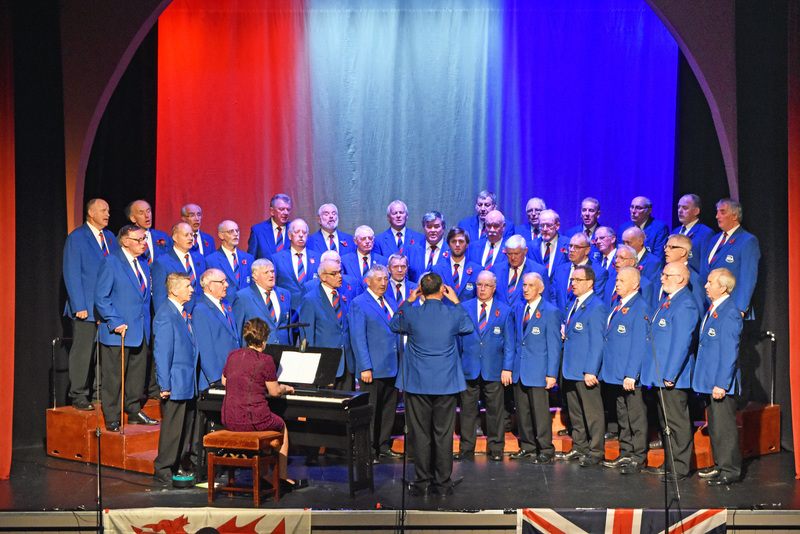 The Choir was pleased to be invited to be part of Builth Wells Royal British Legion Remembrance Concert at the Strand Hall to commemorate the 100th anniversary of the end of WW1. The Choir performed two sets of songs under the direction of Luned Jones and Adrian Morgan with accompaniment by Ann Bufton. The Choir was pleased to take part in a fundraising concert for The Bracken Trust in a marquee near Llangunllo on Sunday 30 September. A full audience was entertained by a number of young local artists as well as four sets sung by Builth Male Voice Choir. Proceeds from the event amounted to £900 which were presented to the Bracken Trust who passed an a huge thank you to the Choir. 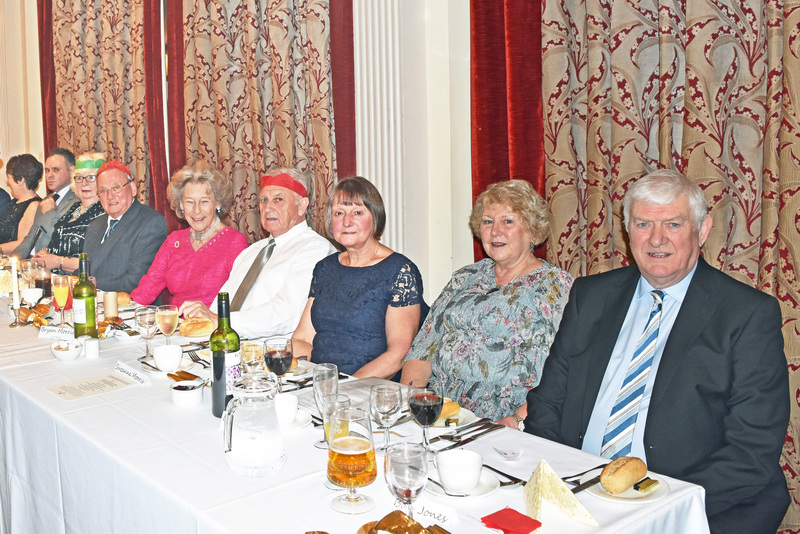 The Choir’s performance at the after dinner concert in the Metropole Hotel Llandrindod Wells was enthusiastically received by members of the Probus Club of Sandbach . The Choir sang two sets of songs conducted by the Musical Director Luned Jones and Assistant Director Adrian Morgan. Ann Bufton was the accompanist. 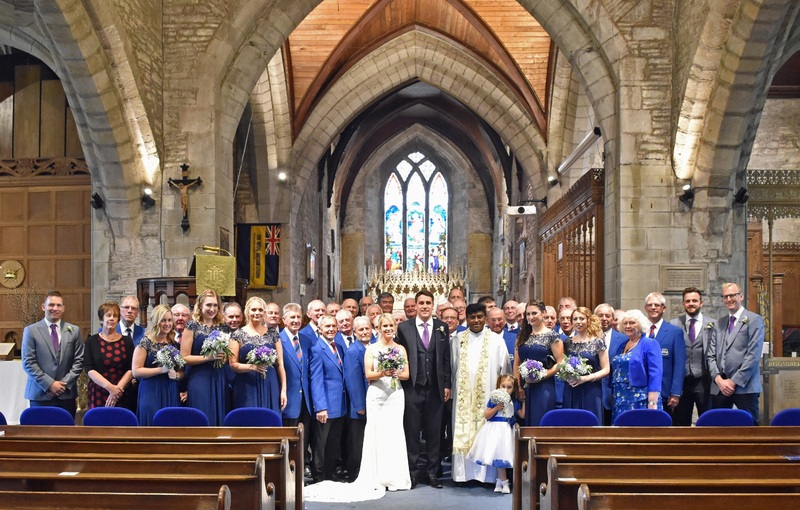 It was a pleasure for the Choir to be invited to sing at Elizabeth and Gregory’s wedding at St Edmund’s Church Crickhowell. The Choir sang to entertain guests prior to the wedding ceremony and during the signing of the register. 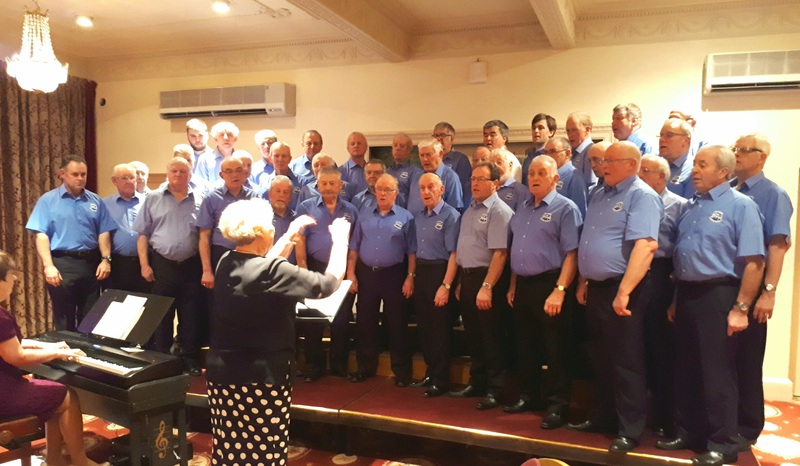 The Choir once again performed for guests from The Great Rail Tours who were staying at the Metropole Hotel, Llandrindod Wells on their visit to Wales. David Power was MC with both Luned Jones and Adrian Morgan conducting the Choir and Ann Bufton being accompanist. The audience, which included a potential new conductor, thoroughly enjoyed the Choir’s performance and many bought CDs as momentos after the concert. 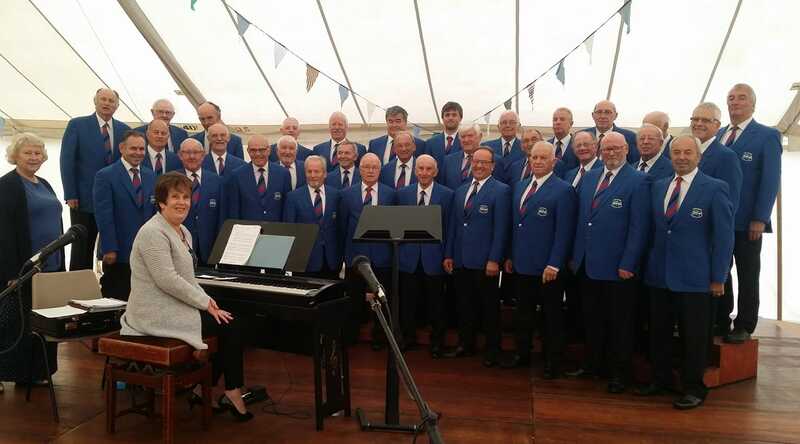 Builth Male Voice Choir is celebrating its fiftieth anniversary this year with a very busy programme of activities. 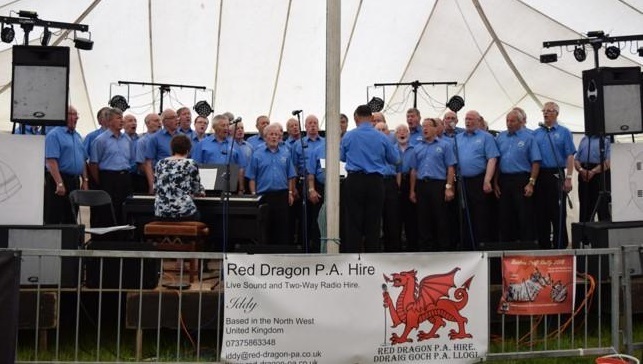 Earlier in the year the Choir supported the Brecon Mountain Rescue Team at its annual charity St David’s Day Concert when the raffle, which was match funded by Barclays Bank, raised £1,000. 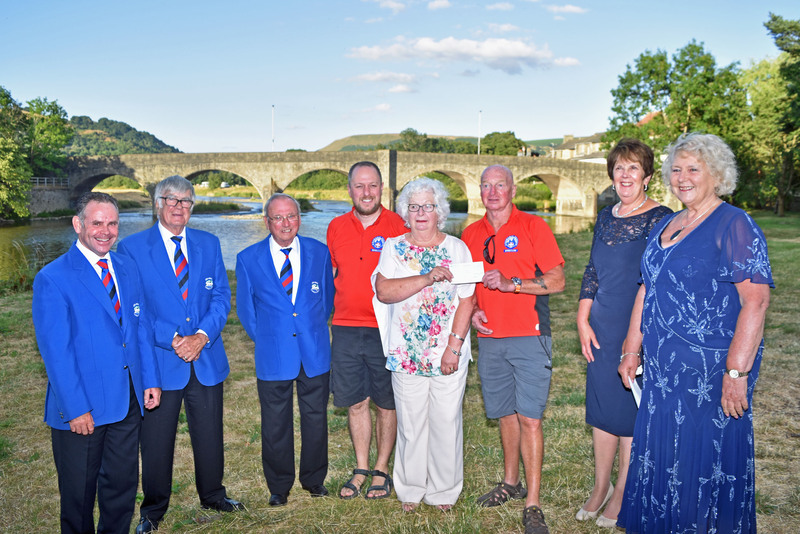 The raffle was organised by the Choir’s Supporters Group and recently Joyce Hope, on behalf of the Group, presented a cheque to Kevin Harding and Robin Bidgood representatives of the Brecon Mountain Rescue Team. This emergency service is staffed entirely by volunteers and funded by donation and operates throughout mid Wales, working from the Brecon Beacons National Park north to Plynlimon and from the Welsh borderland westward to the Ceredigion coast. Joyce Hope on behalf of Builth Male Voice Choir Supporters Group presenting a cheque to Kevin Harding and Robin Bidgood representing Brecon Mountain Rescue Team. Also in the picture Musical Director Luned Jones, Deputy Musical Director Adrian Morgan, Accompanist Ann Bufton, President Jim Evan and Chairman Derek Hope. 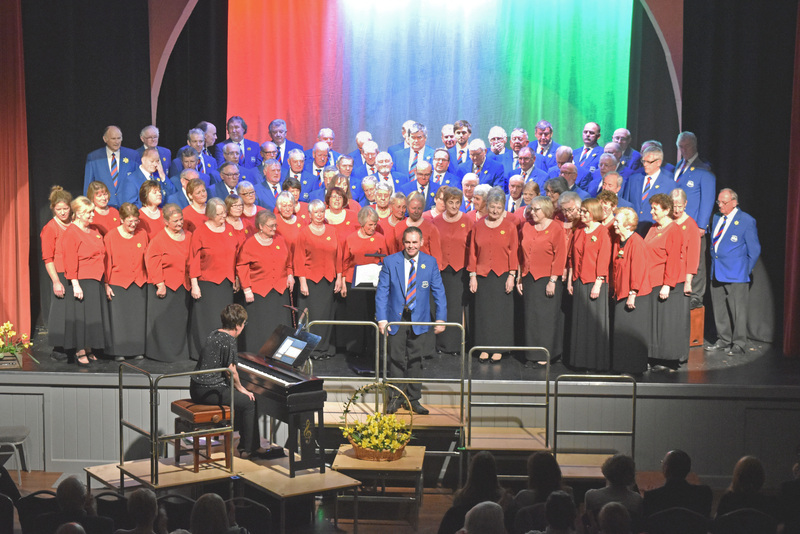 Builth Male Voice Choir will be hosting a Fiftieth Anniversary Gala Concert with guests Mousehole Male Voice Choir (Cornwall), Shân Cothi and Martha Powell (Harp) at The Pavilion, Llandrindod Wells on Saturday 8 September 7.30pm (doors open 7.00pm). This festival of music will also raise funds for charity, this time Amser Justin Time Pancreatic Cancer Charity Wales, to further the essential research needed to support pancreatic cancer patients in Wales. 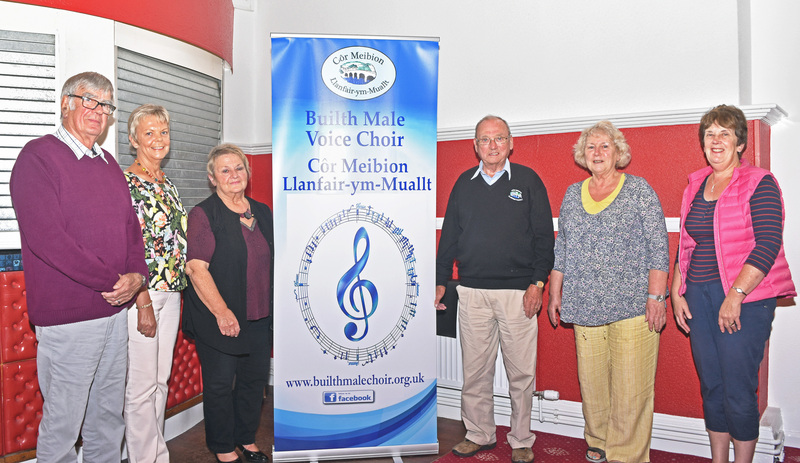 Derek Hope, Chairman of Builth Male Voice Choir, said it was an honour to represent the Choir in this its fiftieth anniversary year. He said the Choir has a proud reputation for supporting local charity groups and has raised many thousands of pounds in the past fifty years and invited new singers to join the choir and continue this support. Information about the Choir can be found on its website www.builthmalechoir.org.uk. 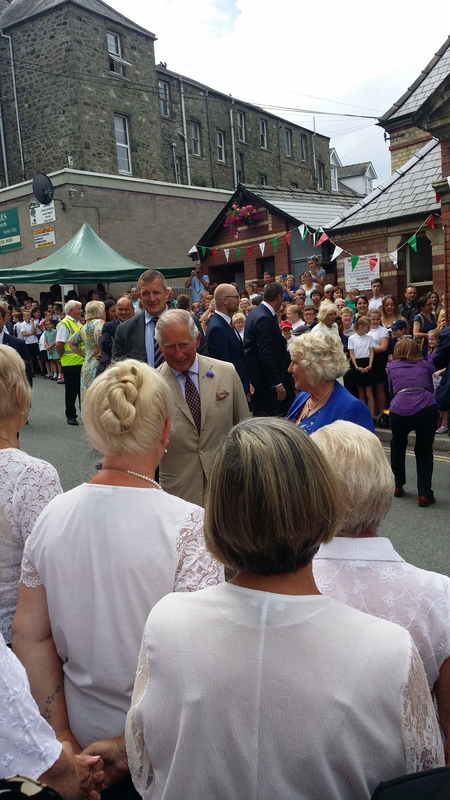 Builth Male Voice Choir & Builth Ladies Choir joined together to sing Calon Lân to welcome Prince Charles and the Duchess of Cornwall at The Strand Hall during their visit to reopen the building. On leaving the Hall the two choirs joined together to sing Unchained Melody. 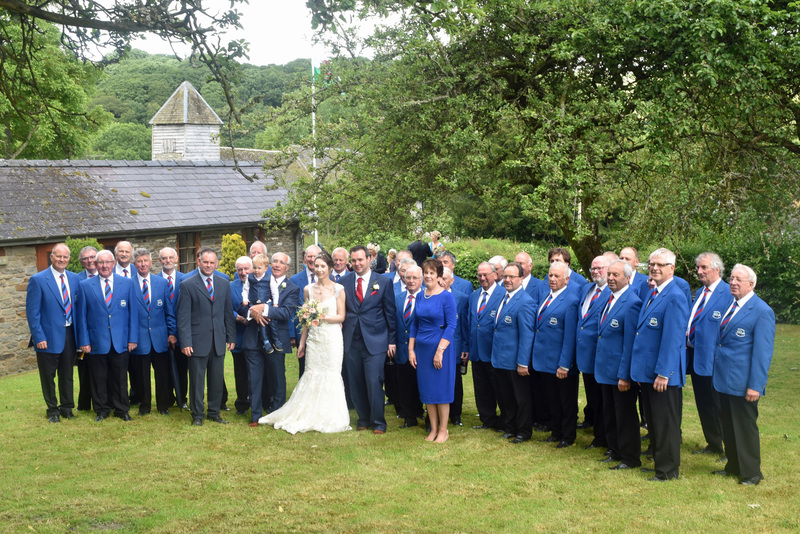 The Choir sang for guests at a wedding reception in Bleddfa on 16 June. At the beginning of their performance the choir accompanied the bride who sang a solo in the traditional New Zealand love song Pokare Ana. 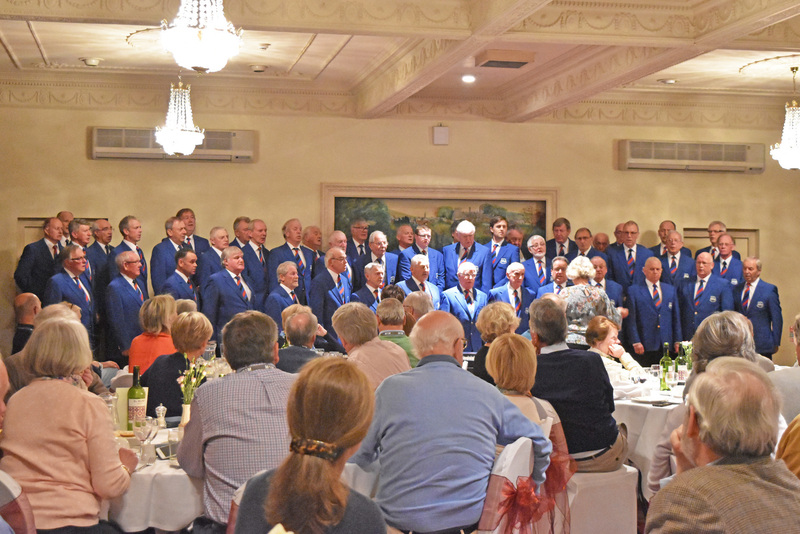 The Choir sang a wide variety of songs including Welsh favourites O Gymru, Calon Lan and Rachie and their performance was thoroughly enjoyed by the guests who had travelled from all parts of the UK. 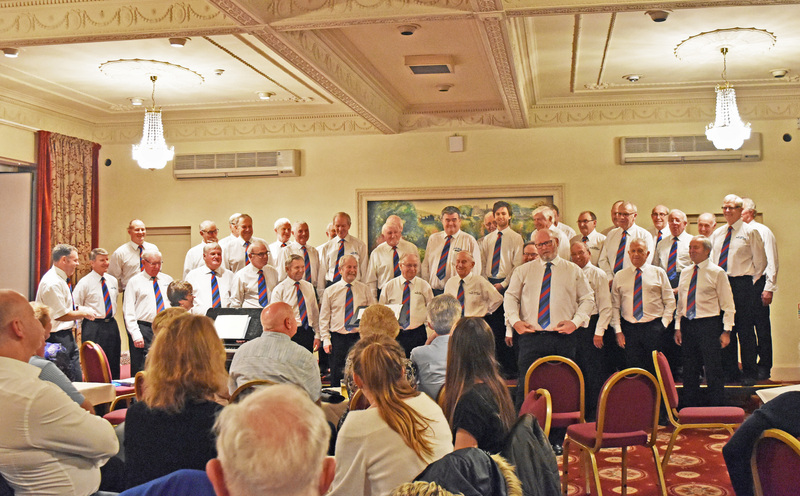 The Choir once again was called upon to entertain guests staying at the Metropole Hotel, Llandrindod Wells – this time visitors from the Great Rail Tours visit to Wales. David Power was MC and entertained the audience with his dry wit – Adrian Morgan conducted and Ann Bufton was the accompanist. In May 2018 the Choir was once again asked to take part in the Rorke’s Drift Rally at Brecon. Adrian Morgan was the conductor and Ann Bufton was the accompanist for a programme of stirring songs which was enjoyed by a very noisy and appreciative audience. Starting with Stout Hearted Men the Choir sang ten songs. A highlight of the event was a recitation by Top Tenor Bruce Watkins who brought a hush to the marquee with his rendition of a poem about the Battle of Rorke’s Drift which culminated in a standing ovation. Another highlight for the enthusiastic audience were two leading organisers of the Rally – The Zulu Chief and the Zulu Witch Doctor – who were called to the front of the stage where the Chief proposed marriage to the Witch Doctor! This was followed by the Choir finishing with Men of Harlech when members of the audience, some dressed in Red Coats and Pith Helmets and others dressed as Zulus, joined in the singing and celebration. 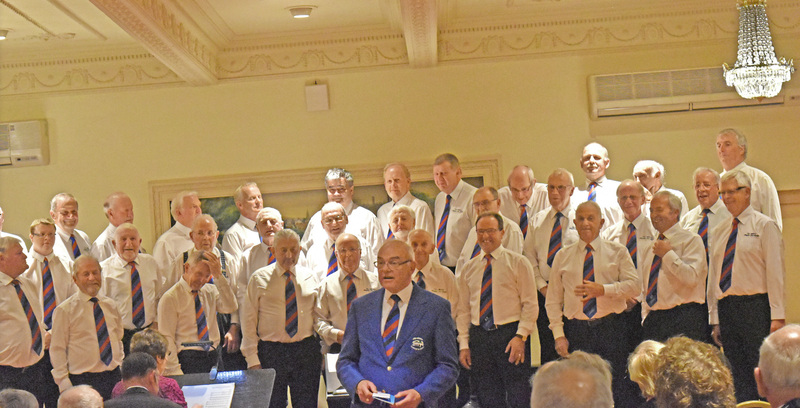 The Choir performed its second concert in two weeks at the Metropole Hotel, Llandrindod Wells – this time to entertain members of the MX-5 Owners Club International Meet. Viv Jones was the compere and the concert was conducted by Adrian Morgan with the choir performing a wide range of songs including With a Voice of Singing, Yfory, Bring him home, Hallelujah, Gwahoddiad, The Water is Wide, Homeward Bound, American Trilogy. At the end of the concert there was a standing ovation and call for an encore which was followed by the Welsh National Anthem. The appreciative audience came from Wales, England and across Europe. After the concert one couple from Arnem, Holland, who had sung in choirs all their lives, said that the concert was excellent and that the control and quality on the quiet sections was superb. Afterwards a number of the audience started their own singing session in bar having been inspired by the Choir. 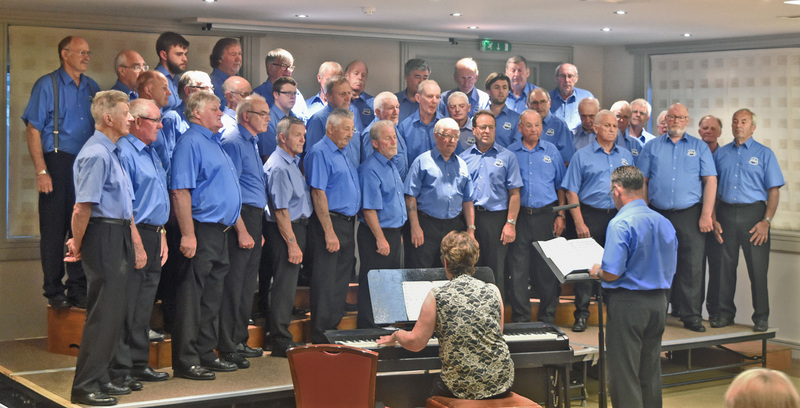 The Choir was asked to entertain members of the Historical Vehicle Club of Belgium who were touring Wales and staying at the Metropole Hotel Llandrindod Wells. David Power was the compere with Luned Jones conducting and Ann Bufton the accompanist. The programme of ten songs was greatly appreciated by the Belgium audience who gave a standing ovation prompting an encore of “American Trilogy” from the Choir. The Chairman of the Vehicle Club thanked the Choir for showcasing traditional Welsh Male Voice Choral music and presented a Rally Sign to the Choir as a memento of the event. 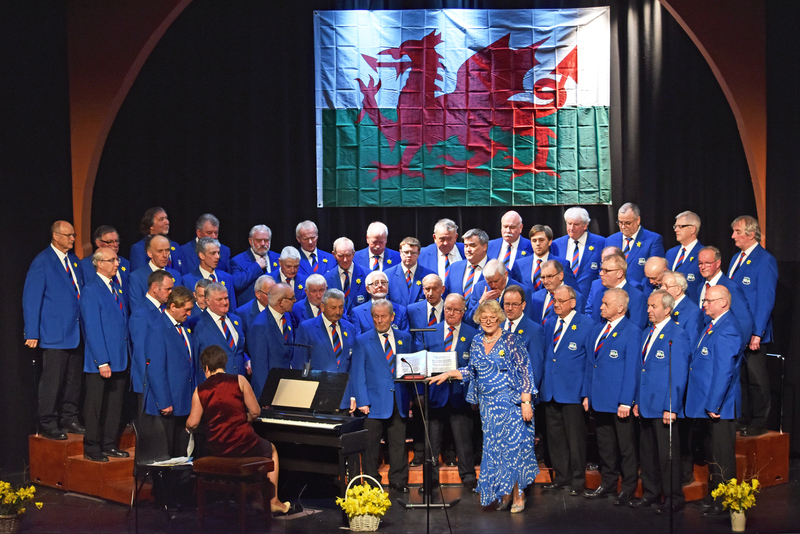 On Friday 23 February for the first time for many years Builth Male Voice Choir was able to hold its St David’s Day Concert in the newly refurbished Strand Hall. 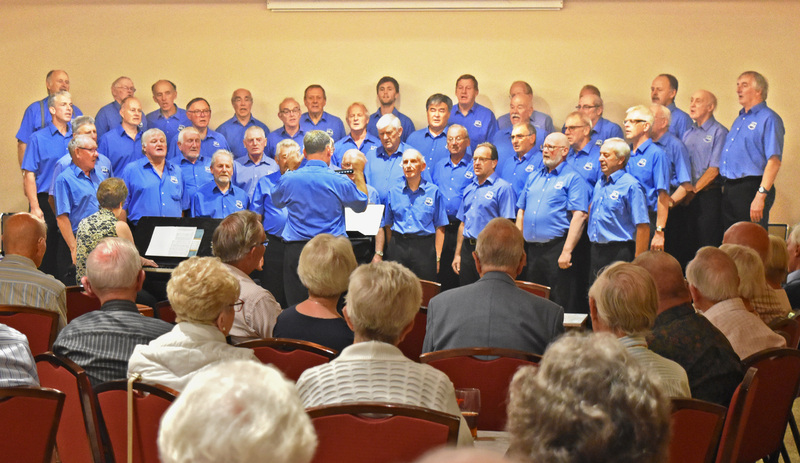 A large and appreciative audience was treated to a feast of music in the annual charity concert which this year supported the Brecon Mountain Rescue Team. 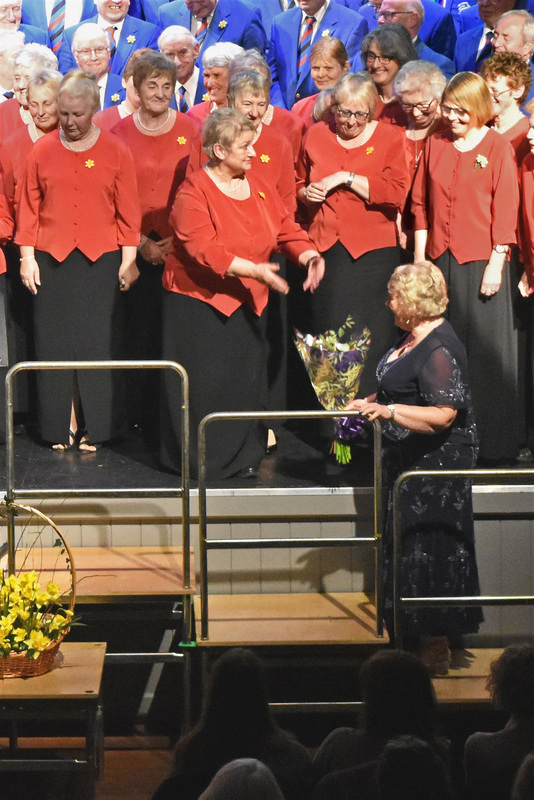 The Concert featured SORELA, a singing trio of talented sisters from Ceredigion, and the children in Builth Wells Primary School Choir and was compered by Viv Jones, Immediate Past Chairman of the Choir. 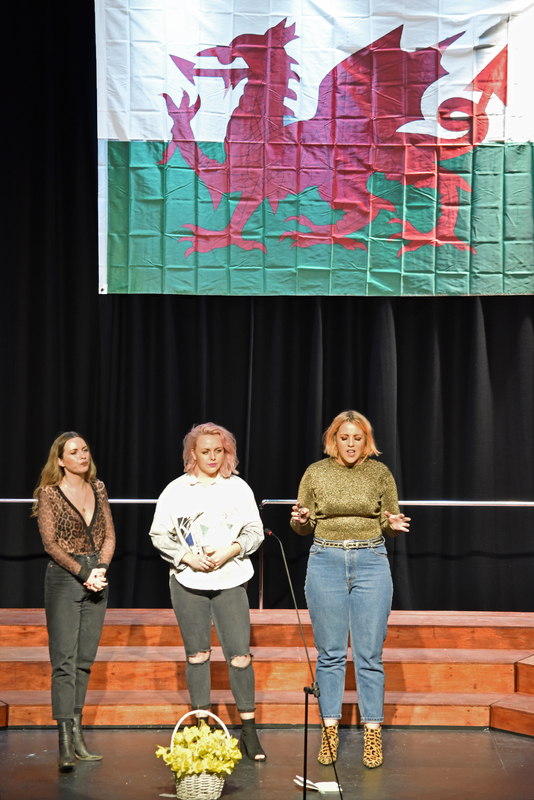 SORELA, an acapella folk trio who frequently appear on S4C television, sang an eclectic mix of traditional Welsh folk songs, 90’s pop hits, 50’s classics and original works all in acapella. 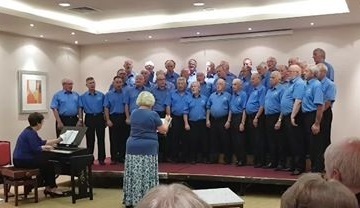 Their performance enchanted the audience and particularly members of the Male Voice Choir who really appreciated their controlled close harmonies. The young choristers from Builth Wells Primary School also charmed the audience with their lively and entertaining performance of three songs – Sing Hosanna, Calon Lân and Song for Every Season – and received a standing ovation. 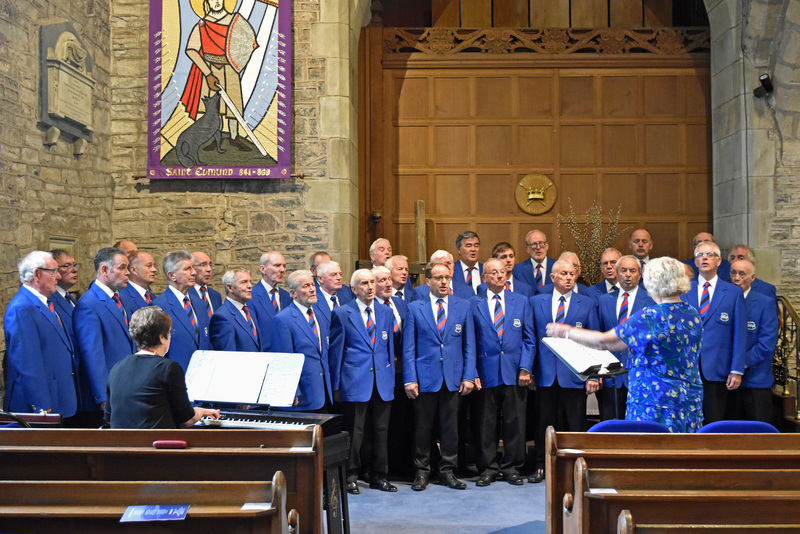 Builth Male Voice Choir showcased two new items – the traditional Welsh hymn Prysgol by William Owen and Sanctus by Cherubini – as well as a number of traditional favourites including The Creation by Willy Ritcher. The Concert concluded with SORELA, Builth Male Voice Choir and the audience singing Calon Lân. Proceeds from the well supported raffle were match funded by Barclays Bank resulting in £1,000 being raised for the Brecon Mountain Rescue Team, the emergency service staffed entirely by volunteers and funded by donations.